While making a quiet dialogue with Nature, my son called me, “Hey, dad. 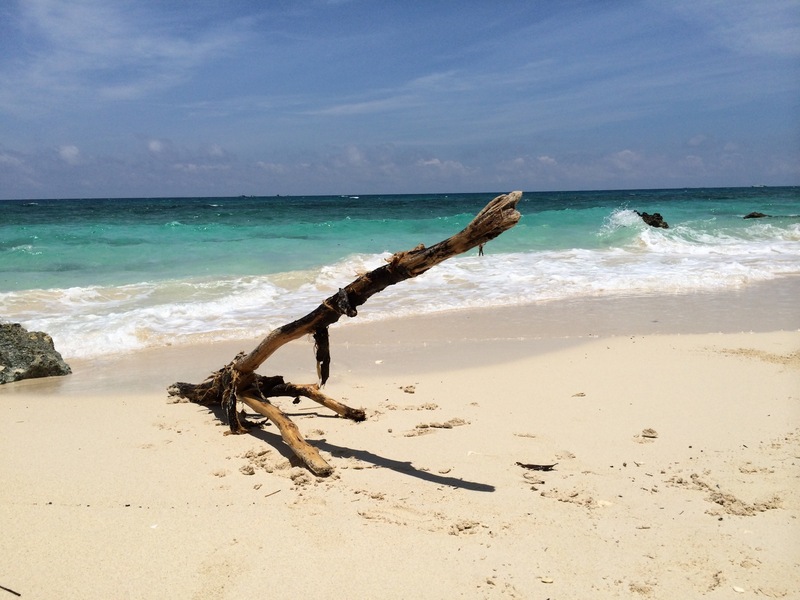 Look, it’s a brain.” As he pushed the dead coral away from the water, he started to talk to it. He was a bit far from me and I couldn’t hear what he was saying. Looking at him and the coral, it looked as if the coral was trying to tell him a story. May be it was telling him how he died and lost his home. How from the years of unchecked, careless, insensitive greed and tourism, he and his community were slowly driven to near extinction. A sad tale that is still happening this very second around the world. Then he said, “Now, I’m making a home,” as he carefully added more sand details around and above the coral. He also used his hands to make a wall and shield the coral from the approaching waves. Sometimes, it takes an innocent child at play for us adults to realize the things we had done or others had done. It also takes a child to remind us that no matter how small, we can do something to help, reverse and rebuild. If we love Nature, then it’s time to make a serious dialogue with it. Early morning, on my last day in the island, I walked by the beach from our hotel towards the hospital. Every few feet, I was greeted with empty plastic bottles and wrappers, beer glass bottles, even a light bulb and a medicine ampule. I felt a mixture of shock, concern, anger and annoyance. 11 years ago, when there was less tourism and development, the shoreline was cleaner. I picked up a few and throw them in the garbage can. A lot of people treat nature like one big garbage can and expect it to clean itself and always be beautiful for their amusement. A lot of people use nature like its inexhaustible but it’s not. If we want our children and the future generation to enjoy nature the way we did, then today is that day to start caring for it. All images captured by my iPhone 5S in Boracay, Philippines. An island where if I search hard enough and begin the day when most tourist and locals are still asleep, bits of paradise still reveals itself. And yes, me and this island made so much dialogue to each other for so many years that I already considered it as one of my many homes that I need to go back and protect. I hope those who live in it, visit it and those who make tons of profit from it will find in their hearts to listen to its cry. If an 8-year old heard it, so can we. Thank you for island hopping with me. Hope it brought you back to places and memories of island paradise. 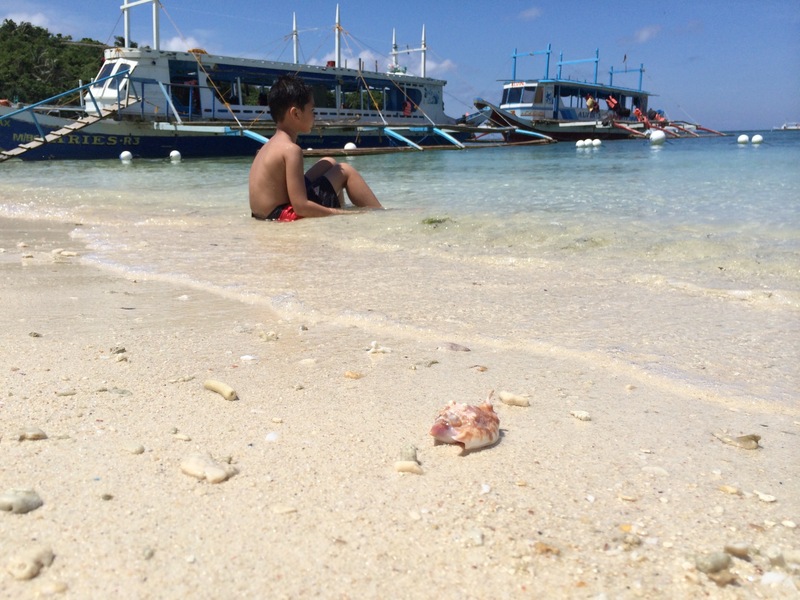 This entry was posted in nature and tagged Boracay, Family, fatherhood, Inspiration, Kids, Life, Nature, parenting, Photography, summer, Travel, Weekly Photo Challenge. Bookmark the permalink. It is saddening to know that people are so careless and could not be bothered to take care of their trash. Sigh! It is sad how so many mistreat nature and how so many are so indifferent to their careless ways. When we look around us, years of selfish abuse of nature and our environment are taking are reaching horrific proportions. I hope it’s not too late for people to change. Thanks. those images are incredible, and you have surely treasured seeing your beloved homeland through your son’s perspective. we are sometimes nudged into remembering that we only have today, and to squeeze the most out of it… and to always make time for our loved ones. as for the beach trash, i remain amused at the hermit crabs’ use of discarded bottle caps when they upgrade to larger homes. it’s sad yet i admire their creative ways! I know how that feels when the internet’s slows down or totally stop. Pretty much I used my iPhone as a camera while in the Philippines and have to set aside making posts. As for my mom, she is doing well. Thank God she bounced back quickly. As for nature, it is sad and frustrating that so many don’t care despite of the adverse weather extremes and calamities we all witnessed. We all need to do our part, no matter how small. Thanks. Oh if only people took away what they brought in the beginning there would be no litter anywhere.maybe its because the uk has a hard litter law, which alas does not seem to apply to beaches, I find it near enough impossible to drop even a small piece of paper or rubbish. in our car I have plastic bag tied to handle which collects all bits of sweet wrappings and shop checkout slips and any other stuff to be discarded..then eventually that is deposited in bin, and we start afresh. whilst driving from here yo there I can always see bin bags of rubbish just dumped on the roadside or just littered mess.. I too can’t bear throwing even the smallest wrapper. It’s like throwing trash anywhere inside my home. If only people show responsibility and respect. We do have anti-litter law but for so many, when no one is watching, they go back there old ways. For now, best we can do is make people aware, be an example of change, hope and pray that somehow, those who refuse to see will by miracle wake up one morning no longer blind and numb. Thanks Patrecia. Happy weekend. Loved your photos. I got so carried away I nearly forgot why I was here..splendid post. Thank you. It is sad and heart breaking. Each piece of dead coral is a reminder of man’s heartless treatment towards nature. I did and I think I read about it too. What’s happening to our environment scares me every time I think about it. Can’t believe so many ignore the facts and continue to pollute nature. Can’t believe too how so many are still indifferent despite of tragedies all over the world related to global warming, environmental degradation, from a planet slowly suffocating and dying. well I heard that every ocean has at least one HUGE garbage patch – and some have more than others. so sad. Thank you. That is true and despite of the facts, so many abuse nature. Do we need to wait for a huge natural calamity to hit our way to wake up? Last year, the worst typhoon hit the Philippines and part of the reason is Global warming and complete disregard of nature. Every year, natural disasters are getting worse around the globe. Sad and scary. Those were some great shots of your son and your homeland. Duuuuuuuuuuuude and it gets me so upset when I’m outdoors or at the beach and there is all this crap is spread out there messing with the scene. Can’t stand it when people kill nature. But despite the pollution it was great island hopping with you. Can’t stand it too. When I saw the light bulb and medicine vial, I told myself, “Really? A child could have stepped on this. My son could have stepped on this. How can someone be so uncaring?” I realized there were so many uncaring people when I can no longer count the litter along the beach area I walked on. I wanted to scream but them all those who did the act were either still sleeping still or pretending to be asleep. Lovely images! If we could all see things through the eyes of a child maybe this world would be different. God created a beautiful place and it’s devastating what we are doing to it. Yes, God did make our planet beautiful, rich, abundant. We are suppose to be his caretakers, guardians and protectors of all his creations. Greed and selfishness took control for so many of us. So many just stop caring. Sad, very sad. Such a wonderful post on two levels — the dialog between your son and nature, and the deeper dialog we all need when faced with humanity’s impact on our world. And your photographs are beautiful! Thanks Cindi. I didn’t even fully understand what was going on with my son and the coral. He seemed to be just playing until I watched his video. He was talking to it just like when he plays with his Lego and Minecraft. He still has that child magical world of play where everything comes alive and real! Children sees and feel things we adults already lost long time ago but when we are lucky, they open a door for us to see and feel too. My son allows me to see the world through his eyes, to remember and care. For that I am always thankful. I love the pictures but also your thoughts on nature. As a parent, I am concerned not only with the world I get to enjoy but the one I leave behind for future generations. I wish this were universal. Same here my friend. I wanted my son to grow up in a world just as beautiful and safe when I was growing. Sadly, many of it has been lost although it’s never too late for everyone to help out so we can make sure we can rebuild what’s left of our planet as well as create an environment where our children can go out and play without fear. Thanks for making people aware of how negatively they can impact nature. A lot of people see the oceans and seas as one big garbage receptacle because they are so vast. Little do they realize how their ‘little piece’ of garbage can impact marine life. Here’s a fact: the majority of trash is plastic and it takes 500 to 1000 years to degrade so think about that before you throw a plastic water bottle in the sea. That is a scary thought. I hope people truly read and see the facts of plastics, environmental pollution and of everything else going on with our planet. I hope we all do before it’s too late. Oh what a beautiful post illustrating your son’s joyful innocence yet also concern and care as he seeks to make a home for ‘the brain’ 🙂 What imagination and what thoughts as he is lost in his safe world of family love and joy, when all he wants and should expect is a clean, safe beach and surroundings. People who leave litter like this infuriate me as it shows a deeper level of utter selfishness, greed and disregard for others. I will never understand it. Your photos are gorgeous as is your heartfelt and very important message. Thank you so much my friend and God bless you and your family always. Thanks Sherri. The litter I saw that day reflects the hearts of so many not just about the environment but toward others. Whoever threw those glass products didn’t care if a child step on it, or someone can get hurt because of it. Multiply that in global proportion, horrific! With that in mind, no matter how small, we need to be examples of change, to pass on that heart that cares for others. Beautiful Photography Island Traveler , how very real Children are in their feelings and emotions, I’m teaching the Children in my Neighbourhood to keep it tidy, to pick up rubbish etc. I share with them that our Country is a gift from God and that we need to look after it starting with our homes etc, thankfully there has been a big difference at least in regards to our street but to be honest they were copying what Adults do, yes it’s not what they are told but by example that they respond good or bad. I have a great deal of respect for you and your wife and the example you always show your son about Love. Thanks Anne. The best instrument of change is us. To lead by right examples. I know that so many in our world now may even think we are crazy for caring about nature and other people. So many have lived this “It’s all about me” lifestyle and stop listening to what their faith and conscience had been screaming for so long. God speaks to us in many ways for us to see our flaws and wrong doings. He spoke that day, through my son’s playful dialogue with the coral. He helped me listen and see. Thanks Sophia. It is inspiring to see adults, whether teachers, parents or someone who simply cares about our nature teach young children through examples ways to save mother Earth. We live in an era where so many no longer care anymore about others or the environment. All they care is themselves and what they can have in their lifetime. So many live in a “It’s all about my needs” world with complete disregard to what happens to our planet. We have to care. We have to show in our own little way that we hope to save and protect nature. The disregard for the earth seems to before prevalent than less these days. You think we would have l learned by now that we have a responsibility to our Mother. Your son will learn well from you, I’m sure. Hopefully he will make a difference. I hope so. If we love our little ones, we will try our best to make sure they will have a better world to live in long after we are gone. Thanks. A cry from the heart of someone who seems to understand what nature is about. Nature lovers everywhere grieve when we see evidence of abuse to nature. Yes, when we see signs of its death, we weep. It’s great for your son to encounter such an amazing little piece of nature while on vacation. My 8-year old recently asked me why humans are on this earth since all they do is destroy it. Sad to say, but I didn’t have an explanation for it. All I could tell him that it takes one person at a time to make a difference and be good to the earth. Children really are so much wiser than grown-ups. My friend, your words of wisdom is a symbol of hope for your son’s generation and mine, “All I could tell him that it takes one person at a time to make a difference and be good to the earth.”And yes, “children really are so much wiser than grown-ups.” Their heart is pure and full of compassion. Thanks. Bless your son and you for caring so much about nature. Island Traveler, it is heart-wrenching to see a beautiful natural setting spoiled by careless visitors who toss trash about even when there is a trash can nearby. It breaks my heart everytime because I do love that island. Once it was a vision of pure paradise in the early 80’s but then commercialism, tourism and greed creeped in slowly destroying it. As we speak, huge hotels are continually being built. What used to be green old trees are now cold concrete buildings. What used to be fresh sea breeze on the road section are now choking fumes. It is so sad to see change happen – especially when it is negative. Overdevelopment needs to be curbed so that these beautiful places can be preserved. I agree, overdevelopment should be curbed. Unfortunately, in third world countries, money and politics supercedes environmental preservation. I hope everyone wakes up and start caring. Beautiful story and photos and a great message. This will help get the dialogue going and hopefully next time you visit there will be less trash. I hope that positive change will come and people will help out to clean it. Nature’s healing is dependent on man’s capacity to care and respond. A beautiful interpretation of the photo challenge! Lovely photos too. Best wishes to your son this school year. He is having a great time in school though he misses his Minecraft games which he can only do now on weekends. We’d been having breakfast school dates with his mom for 3 days too. he said, food in cafeteria taste good. Thanks. Very thoughtful and well written blog. Our world is slowly crumbling in front of us and unless we take things in strong hands human race will vanish from the face of the earth. That is our worst fear but sadly, so many still act as if Earth is unexhaustable. So many live in the “Now” moment and care only about their wants. We can try to be examples of change and use whatever talents we have to make people aware of what we are doing with the environment. We don’t have to wait for another big typhoon, flood or any natural disaster to changed our ways. I have been known to leave events with a bag of recyclables in hand. Thanks for the reminder to take care of the earth that we have been given. Hopefully, readers everywhere will realize that a more beautiful world begins in our corner of the world. The little things we do will feel like just a drop in the bucket, but combined, all our efforts will keep paradise looking like paradise! Yes, together we can keep paradise looking like paradise. Every effort counts. Every good deed to help preserve nature, precious. What we do now reflects the furture we all will be facing. Do we want to live in a dying planet or a planet close to a vision of paradise? Lovely and important post and photographs! My eldest son worked in the Philippines and brought home a Filipino bride-now I have a darling 6 year old grandchild. I have found, over the years, Filipinos to be gracious, deep, and honest. I also appreciate your photo of human trash left behind. I am near the woods and creeks, and it always upsets me to see trash left behind…we all live in this world, and you are right, for the children, we should work hard to take care of this planet. Oh, wow. Small world. Your son and his wife are blessed to have found each other. Your grandson is blessed to have the best of both cultures. Yes, Filipinos are indeed gracious, loving and affectionate. No matter where we go in the world, their home will always be open to family and true friends. All the best to your family. Thanks. This is a wonderful story of a beach visit by father and son. Touching commentary by the father clearly states why we must preserve and protect our natural places. I grew up around nature. Through the years, I’ve seem so many of it disappear due to modernism and tourism. I’m hoping that what’s left of it, my countrymen will learn to preserve. Very beautiful photographs. You always give a new dimension to the photo challenge. Blogging is an extension of who we are, what we feel, see, think, hope and dream. Sometimes a bit sad. Sometimes fun and happy. Sometimes crazy even. Other times just breezing way through. Life is after all a mixture of all these. Thanks.